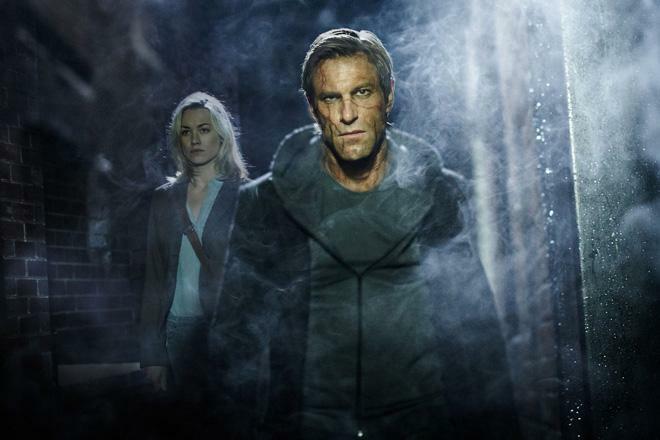 If I were the eponymous monster at the center of Stuart Beattie's 'I, Frankenstein,' I'm not so sure that I would be quite so loud and proud about my identity. I mean, that self-anointing title implies a clear sense of honor and ownership, and after watching the flick, I think a sense of embarrassment and shame are a hell of a lot more appropriate. In fact, our fearless Frankenstein monster should get a whole lot of respect for the sheer courage necessary to admit who he is -– because if I were him, I'd be coming up with a whole slew of aliases. Nonsensical, paper thin, utterly forgettable, and downright dull, the movie is one of the worst action flicks I've seen in a very long time, making it hard to believe that anyone would ever willingly own up to being its star character. Using Mary Shelley's classic novel as a loose jumping off point, the story picks up after the Frankenstein monster -- christened Adam (Aaron Eckhart) in the film -- has buried his deceased creator. He is then attacked by a group of evil demons and subsequently rescued by a band of heavenly gargoyles. The gargoyles reveal that they are part of a secret order charged with protecting the world from the demons and ask Adam for his help. The angry creature declines and instead chooses to wander around for a few hundred years doing… stuff. When the demons reemerge in the present day, they set their sights on capturing Adam, hoping to somehow use the monster for their own purposes. But with the fate of the world resting in his sewn together hands, the centuries-old creature isn't going down without a fight. Now, after that summary you might be asking -- what do gargoyles, demons, and Frankenstein's monster have to do with each other? Well, the answer is… nothing! They have absolutely nothing to do with each other, and for all intents and purposes should never coexist in a film. The script features one of the most random pairings of supernatural creatures to ever hit the screen, and their mingling always feels forced and just plain odd. It's almost like a couple of Hollywood producers got together and decided to randomly pick three different paranormal monsters out of a hat, and this is what they ended up with. And to make matters worse, the mythology that the characters endlessly spill out through overbearing exposition couldn't be any more pedestrian and trite, opting for a simplistic ancient good versus evil conflict with absolutely no depth. The gargoyles are good and the demons are evil and Adam always feels like a bizarre third wheel that keeps tagging along on their dates. Of course, the script does eventually reveal a reason why Frankenstein's monster is important to the demons, but this twist is incredibly silly and the villains' ultimate plan is very, very stupid. Really, the entire plot is paper thin with virtually no deviations or detours from the simplistic point A to point B storytelling, and the filmmakers take the ridiculous premise far too seriously, forgoing any real sense of tongue-in-cheek fun. Character development is also non-existent, and Adam is a complete nonentity as a protagonist. Aaron Eckhart is a very capable actor, but here he is nothing more than a sulking, chiseled slab of patchwork meat. He's a walking grimace, not a character. We're told that the monster is struggling with his burgeoning humanity and deep loneliness, but outside of a few frustrated glances, none of this is explored. The supporting cast is similarly negligible, with competent but forgettable turns from Yvonne Strahovski and Miranda Otto. Hell, even the always reliable Bill Nighy completely fails to register as the movie's central villain. With a script as inexplicably dumb and underdeveloped as this, one might at least expect the action and effects to offer some entertainment value. Alas, that's just not the case. Riddled with a comparatively low budget, the movie never creates a convincing sense of scope, and while the CG and practical effects are all passable, they lack the creativity and sophistication of bigger budget efforts. Likewise, the action scenes are very redundant and uninspired, with several shots of flying CG gargoyles attacking running demons and a few repetitive fight scenes featuring Frankenstein hitting bad guys with his magical whacking sticks (lamest weapons ever). The fight choreography is never very engaging and the battles feel oddly isolated. To this point, we never actually see any innocent bystanders or pedestrians during all of the chaos. Instead, the city's entire population appears to be only made up of gargoyles and demons –- making it difficult to understand what it is they're fighting for. One of the film's central plot points asks audiences to question whether or not the Frankenstein monster truly has a soul –- but as presented here, there's never really any question at all. Adam is one of the most empty, soulless characters to hit the big screen in years, and the entire movie is similarly vacuous. Like Frankenstein's creation, the film itself is an ugly, lumpy hodgepodge of incongruous parts hastily sewn together and carelessly tossed out into the world. Though Adam seems to proudly declare his identity in the movie's title, I can't help but worry about this attention drawing behavior. After all, based on what I've seen here, the creature is now likely to be chased by angry mobs of villagers with torches and pitchforks all over again –- and this time they'll be demanding that they get their money back! 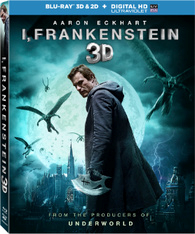 Lionsgate brings 'I, Frankenstein – 3D' to Blu-ray on a single BD-50 disc that comes housed in a keepcase with a cardboard slipcover. A separate DVD disc and instructions for an UltraViolet copy are included as well. 2D and 3D versions are presented on the same disc. After some skippable trailers, the screen transitions to a standard menu. The packaging indicates that the release is Region A coded. The movie is provided with a 1080p/MVC MPEG-4 and 1080p/AVC MPEG-4 transfer in the 2.40:1 aspect ratio. Post-converted to 3D, the image is decent but not terribly immersive, lacking some of the nuance and seamlessness of other better 3D releases. The digital source is relatively clean, but there is some grain-like noise visible throughout. Clarity is good but the picture has a comparably soft and sporadically blurry look to it, lacking the razor sharp quality found in other contemporary digital releases. Still, fine details are readily apparent in close-ups. The 3D work is solid throughout, adding a convincing sense of depth to the image, with clearly defined planes throughout the frame. The manner in which the foreground gradually slopes back into the middle and background in wide shots is especially enveloping. With that said, characters and objects do occasionally project a "pop-up book" quality, and while this effect works well in 2D animated post-conversions, it's less effective in live action films. Likewise, certain scenes exhibit slightly unnatural contours. Thankfully, the movie is home to lots of CG work and these sequences tend to look the best in 3D. Though things can get a little chaotic, flying gargoyles offer some cool imagery, and the spiraling fire effect that circles around the characters, extending out toward the audience, is fun to watch. Colors adhere to a fairly drab palette of cooler hues and there isn't a lot of pop, but this dark and grungy look is intentional. The picture can be a little on the dim side, but contrast and black levels are well balanced. I did detect intermittent cross-talk around objects and characters, but the severity of this artifact will depend on your display type. The film's 2D presentation is mostly comparable, though it of course lacks the added sense of depth, and noise is a bit more prominent. With that said, I found some of the 3D effects to be a little distracting and forced, and the 2D presentation is more even and natural in this regard. 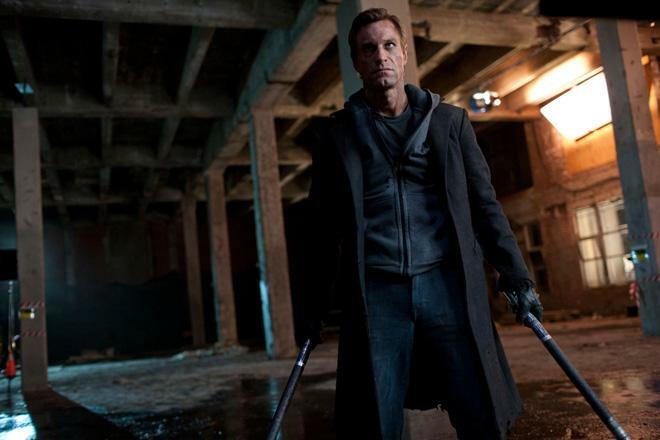 'I, Frankenstein' comes to Blu-ray with a solid but not terribly impressive 3D conversion. The added depth works best in action scenes, adding a decent sense of immersion, but the conversion can look a little unnatural and distracting in other instances. The 2D transfer is also respectable, but detail isn't razor sharp and the image is intentionally drab. The film is presented with an English DTS-HD MA 5.1 mix along with English SDH and Spanish subtitles. Appropriately bombastic, this is an engaging action track. Dialogue is full-bodied and clear throughout, though none of it is actually worth hearing. The soundstage is spacious and relatively lively, with seamless movement between speakers and engaging surround use in action scenes. Demonic growls, passing trains, booming thunder, hard-hitting punches, swooping gargoyle wings, and swirling flames, all surround the listener, and general ambiance adds a pleasing sense of atmosphere to different locations. Dynamic range is wide and distortion free, and though not quite as room-shaking as one might expect, bass activity is engaging and powerful. The mix isn't as textured and layered as some of the best action tracks, but the sound design packs a welcome punch. Lionsgate has provided a decent assortment of supplements, including two commentaries and two behind-the-scenes featurettes. All of the special features are presented in 1080p with Dolby Digital 2.0 audio and no subtitle options (unless noted otherwise). Commentary by Co-Writer/Director Stuart Beattie – The film's director sits down for this track. Topics touched upon include the script's source material, creating the gargoyle mythology, locations, sets, and budget limitations. The director also spends a lot of time complimenting the cast and explaining the plot. While Beattie is pleasant enough, this isn't the most insightful track. Commentary by Filmmakers Gary Lucchesi, Richard Wright, James McQuaide, and Kevin Grevioux – The film's producers, writers, and visual effects crew offer commentary on the film. The group discusses the inspirations for the story, the original comic, the movie's use of Dolby Atmos, the 3D post-conversion process, and the CG effects. There's a good amount of production trivia here, but the track isn't exactly a must listen. "Creating a Monster" Featurette (HD, 13 min) – This is a worthwhile behind-the-scenes featurette focused on the film's production designs, costumes, makeup, sets, visual effects, and action scenes. "Frankenstein's Creatures" Featurette (HD, 14 min) – This featurette offers more behind-the-scenes footage and cast and crew interviews, this time focused on the movie's story. The participants touch upon the film's biblical allusions, original novel, themes, characters, and locations. It's not exactly comprehensive, but fans will likely enjoy the insights offered. Theatrical Trailer (HD, 3 min) - The film's trailer is included with Dolby Digital 5.1 sound. 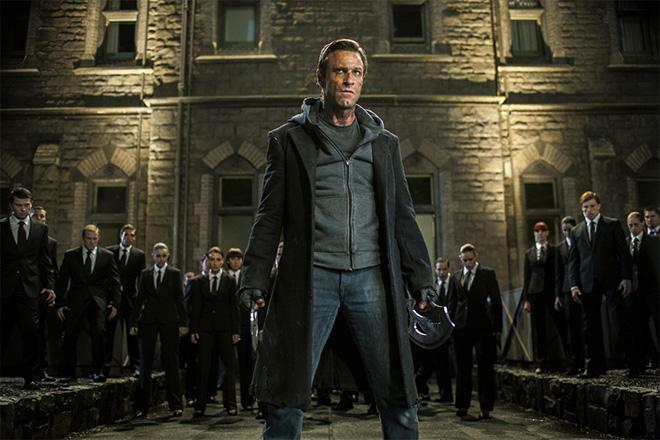 'I, Frankenstein' is an embarrassing attempt at action filmmaking. The plot is inexplicably random, paper thin, and dumb, and the action scenes are disappointingly repetitive and boring. The 3D video transfer is solid, but the post-conversion can be little uneven and distracting. The audio mix is effectively bombastic, bringing some welcome kick to the experience. Though not exactly must listens, the included commentaries are worthwhile and the featurettes throw in some decent behind-the-scenes insights. This is a respectable disc for an absolutely horrible movie. Even fans of CG spectacle aren't likely to find much to enjoy here and there are far better examples of 3D transfers to check out. Skip it.